You then can operate the Droid as usual, and use the Debug Monitor application to grab the current screen from the Droidover the USB cable. Then copy and paste it into an image editing tool to crop and save as desired. This entry posted on December 19, 2009. 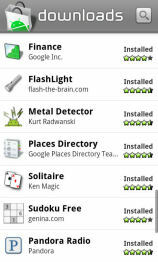 Previous: Finding Droid Apps in the Android Market. Next: Droid Android Apps - Flash-Lights.